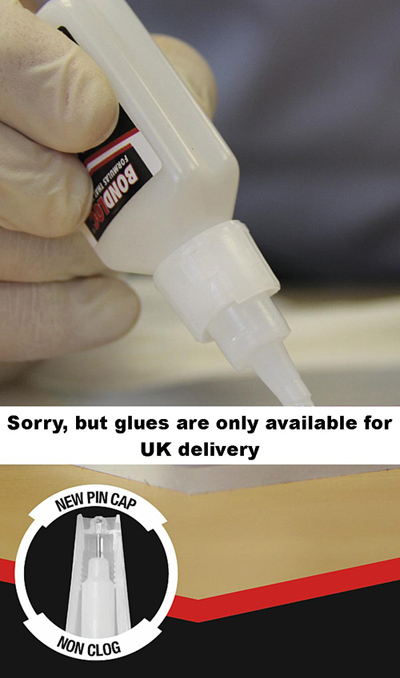 (UK delivery only) High viscosity (thick) cyanoacrylate super glue 50G Great for pen making and large cracks/filling. For safety please ensure its set or activated before starting the lathe! (UK delivery only) Medium viscosity (medium) cyanoacrylate super glue 50G Great for medium cracks and slower gluing setting time than thin. For safety please ensure its set or activated before starting the lathe! (UK delivery only) Low viscosity (thin) cyanoacrylate super glue 50G Great for running into cracks. For safety please ensure its set or activated before starting the lathe! Cyanoacrylate de-bonder based on a hydrocarbon solvent. Used to soften and dissolve cured cyanoacrylate adhesive to enable removal.